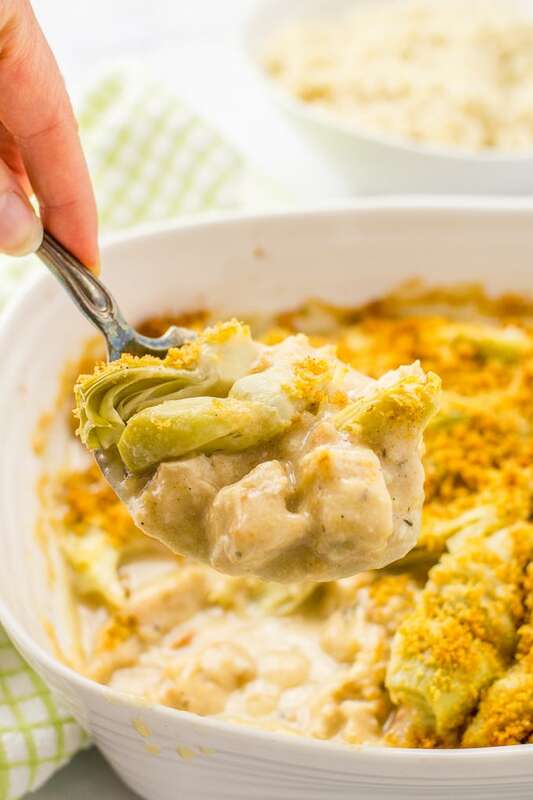 Creamy turkey artichoke casserole is an easy way to transform leftover Thanksgiving turkey into an entirely different meal! How was your weekend, friends? What did you do? 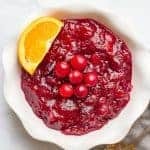 So, anyone with me on loving the Thanksgiving leftovers almost as much — and maybe even a little more — than the official meal? So this week I’m bringing you all recipes for leftover Thanksgiving turkey. 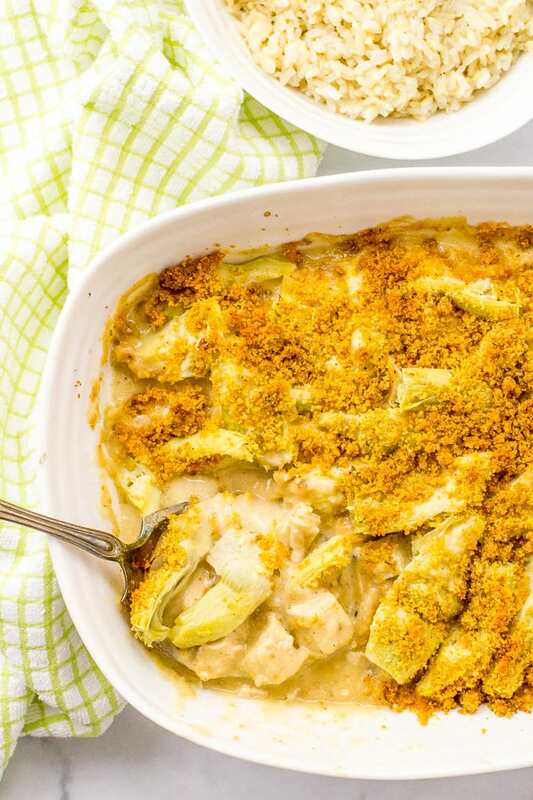 Starting today with this creamy turkey artichoke casserole, continuing on Wednesday with a 15-minute dinner and capping off the week on Friday with the ultimate leftover Thanksgiving turkey sandwich. Stay tuned for deliciousness! 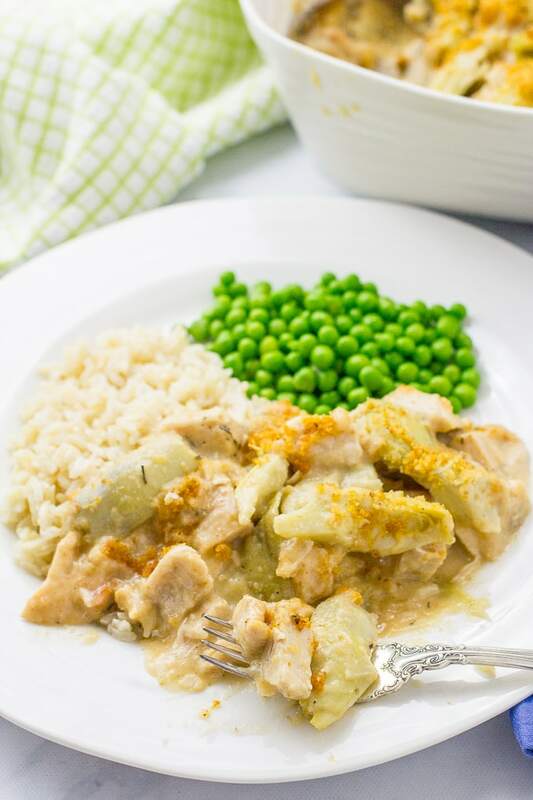 Here, your leftover turkey becomes a whole new meal of easy, creamy casserole goodness. This is perfect when you still have company in town and need to feed a crowd. Or maybe you don’t have leftover turkey but wish you did? Happens to me all the time. 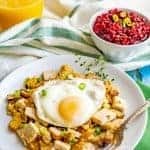 You can make my slow cooker turkey breasts with some basic seasonings (I use salt, pepper and Italian seasoning to make leftovers for things like this). This recipe came from my Christmas Memories cookbook, one of the many that I’ve picked up from used bookstores over the years. I love finding community cookbooks like this with people’s favorite homemade recipes – just feels like there’s so much love and history there. It’s not for sale though, so no Amazon link – sorry! But at least you still get to enjoy this reicpe! This is designed for leftover turkey, but you could also use chicken. And you can add leftover ham if you want to do ham and turkey. Just use a total of about 4 cups of whatever meat you choose. You can make this ahead through step 4. Cover the casserole and put it in the fridge. 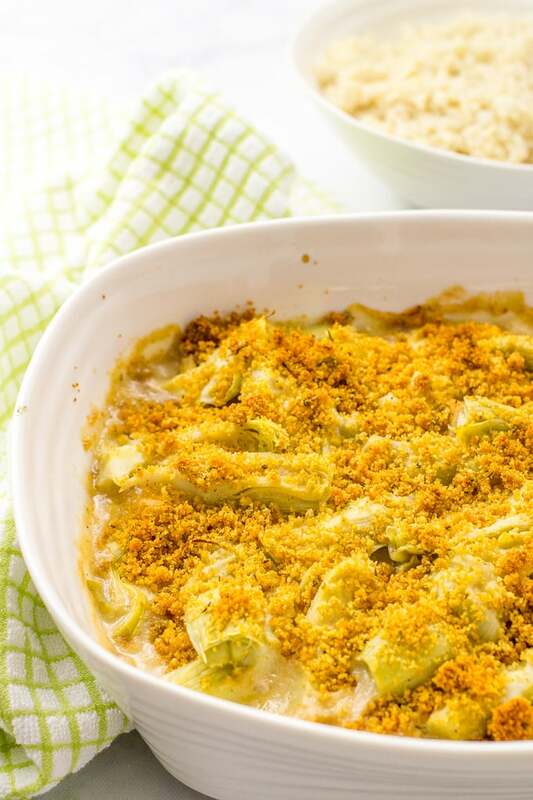 Take it out while you preheat your oven and add the breadcrumb mixture before baking so it will get crunchy. Add 5-10 minutes to the cooking time. It will be ready when it’s bubbling all around the edges. You can try adding some frozen spinach (that’s been thawed) or some peas to have some greens in here. If not, we like to serve this over rice and have some buttered peas on the side. You could also serve it over leftover mashed potatoes if you have some and do a simple spinach salad. 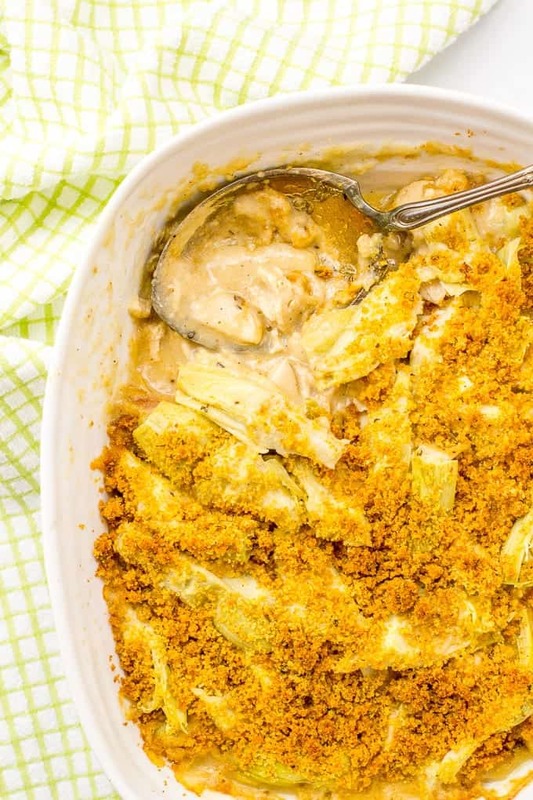 Me, who adds salt to everything, didn’t think this casserole needed it at all. It will depend on the seasoning of your leftover turkey, however, so taste and adjust to your liking. I’d also love to connect on social media – follow me on Facebook, Instagram, Pinterest and Twitter for more recipe goodness! Check out this VIDEO to see how easy this is to make! 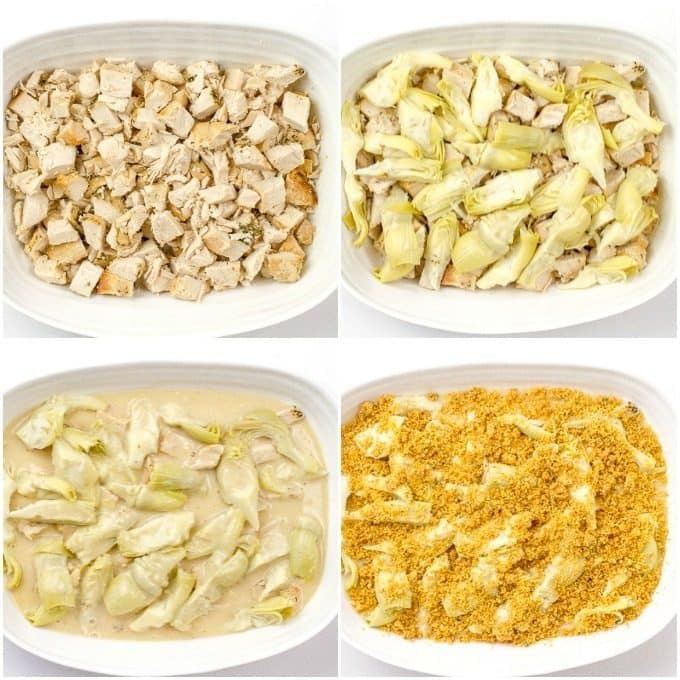 Place turkey and artichokes (quartered) in bottom of a greased 2-quart casserole dish. Melt butter in a small saucepan over medium heat. Add flour and nutmeg and whisk to combine. Cook for 1 minute, stirring constantly. Slowly add chicken broth, whisking constantly, until well combined with no lumps. Let cook 4-5 minutes until thickened. Stir in cheddar cheese until melted and turn off heat. Pour over turkey and artichokes in casserole dish. Combine melted butter with breadcrumbs and remaining seasonings. Sprinkle over top of the casserole. Bake at 375 for 20-25 minutes, until bubbly. 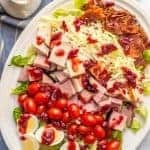 You can use a combination of leftover ham and turkey, or use leftover cooked chicken, for this casserole if you prefer. I don’t add salt to this, but depending on the seasoning of your leftover turkey, you may want to. Taste and adjust to your liking. I hear ya! 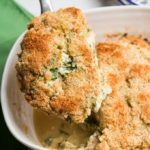 It’s great fall/winter comfort food! Leftovers are definitely where it’s at 😉 Thanks Brynn! The leftovers are the BEST, because they turn into suppers like this one! CAN’T. WAIT. Great ideas! I also mention spinach and peas as possible additions in the blog post. Lots of ways to customize this and add some veggies! 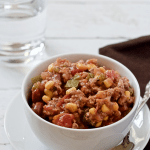 Great twist on a classic supper! It’s delicious! I hope you try it!